The chart below shows the total number of minutes (in millions) of telephone calls in Finland, divided into three categories, from 1995 — 2004. 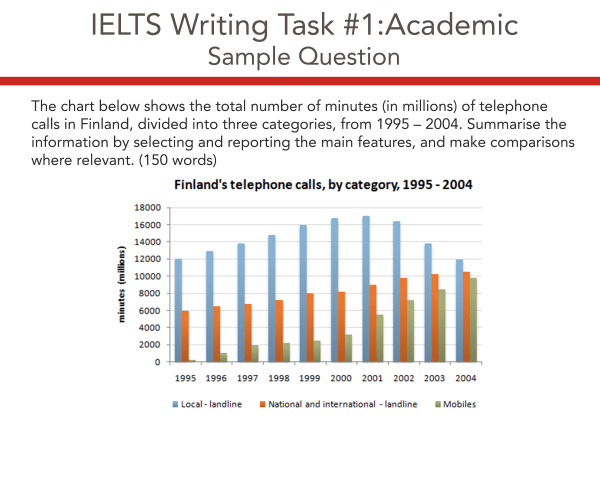 The bar chart shows Finland’s total time of telephone calls in minutes over a period of ten years from 1995 to 2004. The total time of telephone calls is divided into local-landline, national and international-landline and mobiles. Firstly, local landline call time increased steadily from 1995, reaching its peak by 2001 of about 17000 million minutes. Following that, local landline call duration declined sharply reaching the same duration as in 1995 amounting to around 12000 million minutes. Secondly, national and international call duration steadily increased from 6000 million minutes in 1995 to over 10000 million minutes in 2004. Thirdly, mobile phone call time increased gradually from 1995 to 2000 starting with few hundred million minutes and reaching a total duration of 3000 million minutes in 2000. Subsequently, there was a dramatic increase in mobile phone call duration from year 2000 reaching around 10000 million minutes by 2005. In sum, total call time increased from 1995 in both national and international landline and mobile categories. Even though local landline call time increased during the first six years, there was a steady decline from 2001. 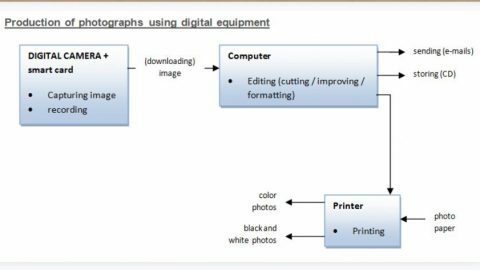 IELTS Academic Writing Task 1 Model Answer – Process Charts – Production of photographs using digital equipment.